Prince Harry and a very pregnant Meghan Markle paid tribute Tuesday to victims of the New Zealand terror attacks that claimed the lives of at least 50 people. The royal couple brought flowers for a memorial outside the New Zealand House in London and signed a condolence book. "Our deepest condolences. 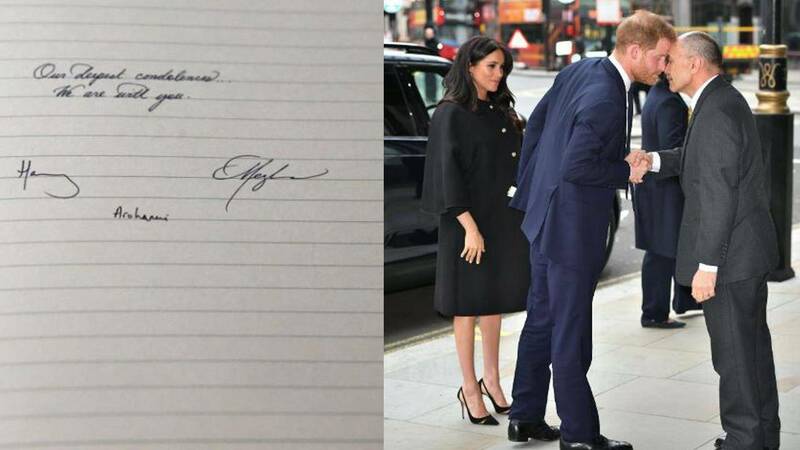 We are with you," Meghan wrote in stylish calligraphy. Harry signed his first name and wrote the Maori word "arohanui," which means "with deep affection." Meghan, who is due to give birth soon to the couple's first child, wore a black dress and coat, with gold earrings designed by New Zealand's Boh Runga. They were a gift from the island nation's Prime Minister Jacinda Ardern. Harry wore a navy suit. The royal family condemned the shooting attacks at two mosques in Christchurch on Friday. "Our hearts go out to the families and friends of the people who lost their lives in the devastating attack in Christchurch," read a statement from Kensington Palace on behalf of princes William and Harry, and their wives Kate and Meghan. "No person should ever have to fear attending a sacred place of worship," the statement continued. "This senseless attack is an affront to the people of Christchurch and New Zealand, and the broader Muslim community." Harry and Meghan had visited New Zealand, stopping in Auckland and Wellington, as part of a royal visit last year that also included Tonga, Fiji and Australia.